Twenty-one-year-old Sophia Wilansky was identified by her father as the woman in horrific photos circulating on social media showing her severely injured left arm that appears to be so mangled her bone is visible. Sophia is currently in stable condition at a Milwaukee hospital and doctors are working to save her arm, but an amputation may be necessary. A GoFundMe account has raised more than $250,000 for the woman’s medical bills, as of Tuesday night. The woman, along with hundreds of other protestors, or “water protectors” as they call themselves, were on the Backwater Bridge along North Dakota Highway 1806 when violence erupted on Sunday night. Protectors claim rubber bullets, tear gas, a fire hose and concussion grenades were used by law enforcement. The woman’s father stated she appears to have been shot 14 times by the non-lethal ammunition. 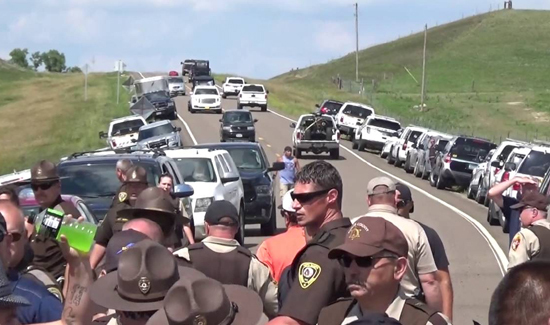 Two protectors, who say they were near the clash, told 12 News it began after several people removed a vehicle acting as a makeshift barricade that was blocking access to the highway. The road runs north to Bismark, which is the closest major city, and also the fastest route to hospitals. Concern over quick access to medical facilities prompted the protectors to move the vehicle. They also claim they raised the issue with the Morton County Sheriff’s Department multiple times before taking action.